One of the biggest differentiating factors between web marketing (inbound) and radio, TV, newspaper, billboard, print, (outbound/interruption) etc... is the availability of EXACT data on how your marketing is performing. This can also pose a challenge though. With so much data available, it's easy to get lost in the weeds. For small businesses, just knowing 4 simple web marketing metrics will keep you well ahead of your peers when it comes to measuring performance and adjusting to improve. Are there many, many, many, many more metrics that you could/should measure? Absolutely! My point here is that most small businesses don't even know these 4 simple web marketing metrics for their efforts. Start here and customize/add to them over time. When we ask most small businesses how their search traffic is performing, most of them don't even know where to look to find that out. They know their site isn't performing for them, in that they don't have new leads flying through the door every day, but they have no clue whether they are getting ANY traffic from search engines. SEO is a good place to start if the leads aren't coming in. One of our first steps when we take on a new client is to add Google Analytics tracking to their existing site, so we have some baseline data to compare the new site or new SEO strategy performance to. To know if you're improving, you need to know where the bar currently sits. It's super easy and affordable online. It's vague at best through other marketing channels like radio and print. Knowing the volume of organic search traffic from month to month and year to year is a very broad way to tell if your SEO is working. Surely, you'll want look more specifically at the quality of search visits you're getting, and if they are taking the actions you want them to take. As a way to get to that point though, you should at least know the overall organic search traffic. Most small business' primary goal for their website is to help generate new clients and sales. To know if your web marketing efforts are improving, we need to know a baseline for how many sales leads are generated per month through your actual website. Website generated leads may have found your website and filled out your contact form. They may have found your website and called the number listed on the site. They may have clicked an email link to someone at your company. They may have opened an email marketing message, clicked through to your website and called you. There are countless scenarios that could have happened. They key is knowing at minimum that the lead ultimately came from your website. There are a few simple techniques that you can use to differentiate a website lead from the others. First, the phone number displayed on your website can be a custom 800 number that only appears on your site. If the call comes in over that number, you know they came from the website. New 800 numbers are VERY inexpensive if you look online. Don't use your telephone provider as it will usually be more costly than it needs to be. Do a quick google search for 800 number setup and you will find plenty of options. The second way to tell that they came from your website is to keep track of the contact or quote request form submissions. This one is definitely the most strait forward. If they fill out a form on your site, they definitely came from your website! Third, using email links in your content to people at your company can also be tracked. Simply create an email alias like websitecontact@yourdomain.com. You may need one for sales, support or any other area of your business that is represented on your site. When an email comes to the appropriate address, you'll know that they came from the website. Last, but not least. When someone calls or emails and becomes a lead, ASK THEM HOW THEY FOUND YOU!!!! This should be ingrained in all potential client touch points. It may seem like just another added step of the process, but for God sake, it will save you time and money as you invest less in marketing tactics that yield less results and more in those that make it rain! This metric is obviously dependent on #2 above. 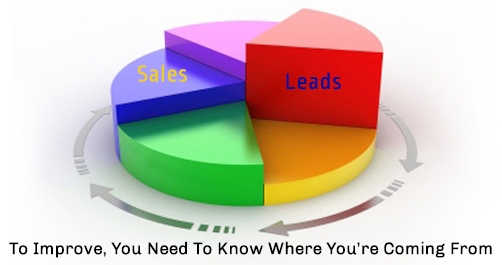 You have to know the number of leads you're generating first. Then, you need to figure out how many of those leads become sales. This may take a more than a month or 2 of data to determine because your sales process may be long. Ultimately, you need to be tracking the sales that resulted from leads generated through your website. Knowing this rate will greatly improve your ability to compare web marketing tactics against interruption based tactics like cold calling and direct mail. Again, when you have a handle on this metric, you should start breaking it down to determine which peripheral sources yield the most sales. Does your weekly email campaign account for the most final sales or is it your LinkedIN page? There are so many more KPIs and metrics that you CAN track online, and that we would highly recommend tracking, but you need to start here if you aren't keeping track of any metrics now. You can't improve if you don't know at least the basics.